This is a basic drop donut recipe that turns out to taste exactly like donut holes. I coated mine with cinnamon sugar but powdered sugar or some type of glaze certainly works as well! The recipe is from food.com and i just want to spread it around because it is absolutely, 100% delicious! Mix together with a spatula and using two spoons, make a small ball, about a teaspoon (once in the fryer it will puff up) and drop into the fryer. Place on paper towel or brown paper bag to drain and roll in desired coating. This recipe is so simple and quick to make! Go put down whatever you are doing and make these donut holes! I have made this decadent blueberry cake twice, and every time the entire cake disappears within 2 days. I eat a couple of slices and then friends and family members devour it EVERY. SINGLE. TIME. Cutting the fat content as compared to a regular cake by 1/2 makes this cake more guilt-free, and also it has blueberries in it… so that makes it more healthy? mmm yeah, that’s my mentality. sift the flour and set aside. In a medium bowl, cream butter and sugar together. Add the egg. In another bowl, combine all dry ingredients and pour into the butter sugar mixture. Place the mixture into a round cake pan with non-stick cooking spray. Place blueberries on the top, pushing them halfway down so the top of the blueberries are visible. Bake for 30 minutes (more or less depending on the oven). I then finished off the cake with sifted powder sugar. So, this cake can be quite pricey at grocery stores, but you can make it at home with that secret greek yogurt ingredient! Make this cake and wow your guests and family members! YESSSS Anything lemon related just makes my mouth water and my tummy rumble. I’ve made lemon bars, lemon curd, lemon cake which all made me super happy. But today’s recipe is Lemon Crinkle Cookies! They’re certainly a good Christmas time cookie, but I experimented with them and could not wait to share this recipe! The unique aspect of a crinkle cookie is the cracked texture of the shell. The powdered sugar on top cracks open, revealing the true color of the cookie. I have to say, a lemon crinkle cookies does not look as good as a chocolate crinkle cookies because the light beige/yellow color of the cookie is too similar to the white powdered sugar as compared to a dark chocolate crinkle cookies where the black and white contrasts obviously. Nonetheless, the crinkle effect on the lemon cookie is still visible and absolutely delicious! In a bowl, whisk granulated sugar and butter until creamy. Add egg, vanilla extract, lemon zest and juice and whisk. In another bowl, combine dry ingredients and then pour into wet mixture in 3 batches, slowly using a spatula to combine the mixture. Once all combined, place powdered sugar in a shallow bowl. 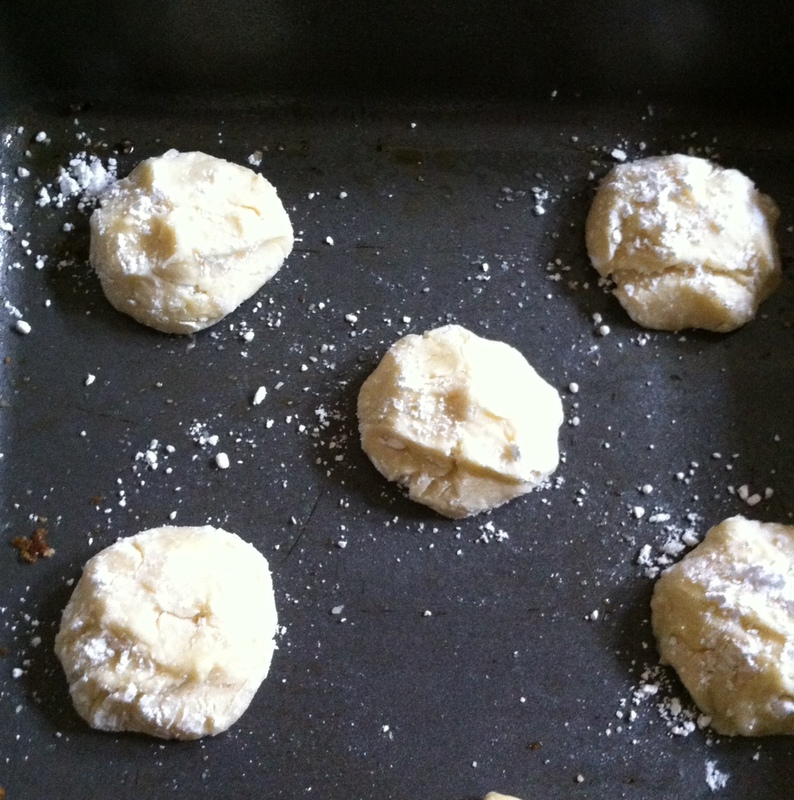 Using a spoon or mini ice cream scoop, scoop up balls and place into the powdered sugar coating every side. Place onto a baking sheet sprayed with non-stick spray or parchment paper. Bake in preheated oven a 350 degrees for 9 minutes. Remove cookies with spatula and cool. I first found out about Moussaka when I went to Yia Yia Mary’s. As disappointed as I was because they served me an average sized serving of the moussaka and I really should’ve ordered two because it was so scrumptious, I was so glad I was introduced to the dish and now am able to recreate it at home! 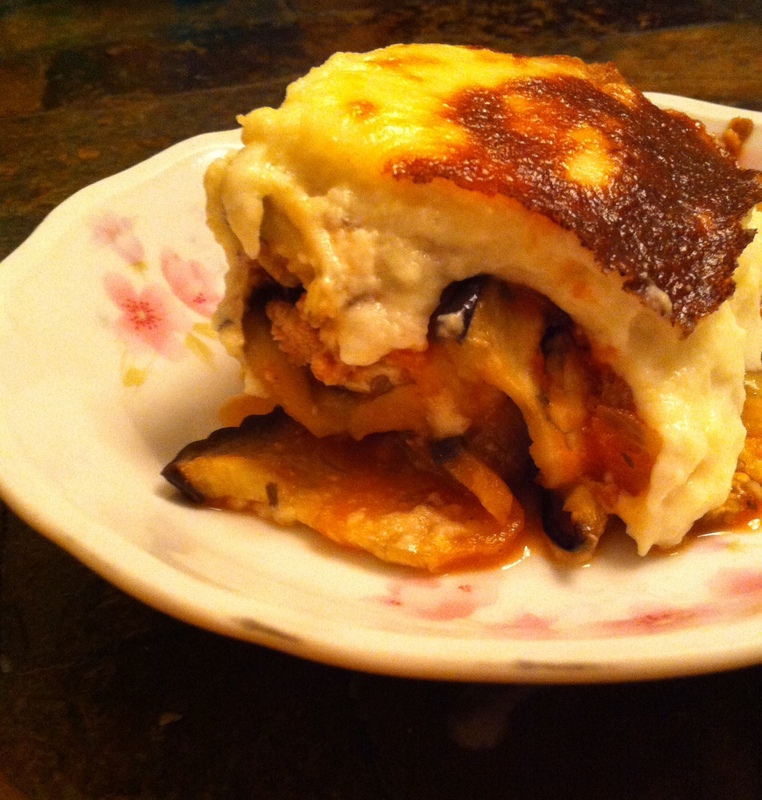 The filling for moussaka is very simple to make, but what makes moussaka a moussaka dish is the creamy cheese filling on top. The first time I made the moussaka, my filling was a bit hard and flour-y tasting so I tweaked the recipe a bit to result in a delectable smooth, creamy filing. The cream is so good and obviously not very healthy which is why I have only made Moussaka twice within a span of ten months. Heat a little oil in a skillet and add ground turkey until completely cooked. Pour into a bowl and using the drippings from the turkey, cook the onions until brown and add the turkey back in. Add the tomato sauce, garlic, and herbs and cook until all well combined. In a casserole dish, layer the bottom with eggplant slices, add the meat mixture on top, and repeat the layering process two more times until there are 3 layers of eggplant and sauce. In a small saucepan, heat the margarine until melted and add flour, constantly whisking so the mixture doesn’t burn. Add the cup of milk and stir for two minutes. Slowly pour in the egg mixture so the eggs don’t scramble. Whisk for another minute and then add the cheese. Whisk the mixture until it becomes completely smooth. Pour the cheese mixture onto the entire casserole mixture and bake in the oven at 350 for 20-25 minutes. Whew! That’s is pretty tedious but the result is amazing and it is a great fall dish to serve to guests. Enjoy! I used to think cornbread was dry and tasteless, and I often wondered why people even enjoyed it, But as I grew older, I gradually began to like cornbread and yesterday I was actually craving it. And so I wet to the grocery store and bought a 2-lb bag of cornmeal for $1.04; everything else I has at home because cornbread truly is a quick and cheap staple to make.. In a square pan, or whatever sized pan, spray with nonstick spray and heat in oven at 450 degrees F for 2 minutes. Take the pan out and pour batter in. Let the cornbread bake for 20 minutes, or more if necessary. The one thing I love about this recipe is that it has actual corn kernels in it. Many times I eat cornbread without the kernels and although it is absolutely delicious as well, I love getting the munch from the kernels, and in fact, it is cornmeal we are dealing with so I feel the addition of corn kernels takes it up a notch. When the cornbread comes fresh out of the oven, I like to smear a little butter or drizzle with honey. Fresh out of the oven is the best time to eat it!